I am the founder and CEO, and sometime barista at Cambia. We’re an internationally focused non-profit social enterprise based in Australia. I intend this blog to be somewhat more intemperate and opinionated than our normal work product would be. Why should a multinational (e.g Monsanto) participate in an open source initiative? Reinventing Wheels: How biological open source licensing works. Not Access to Knowledge, but Capability to Use Knowledge! Promiscuous patenting: Why does a dog lick himself? After almost 30 years of thinking and occasionally speaking about the hologenome theory I’m registered for the Gordon Conference in New Hampshire in June. I hope I can meet some open minded and thoughtful people with whom to discuss these thoughts. Since Gordon Conferences operate under what amounts to Chatham House Rule, and communications can’t be quoted (not that I am likely to publish much at this rate) I thought I’d at least post my abstract here in the dusty old blog. The Hologenome Theory of Evolution: The origins, logic and implications of a ‘cloud genetics’. The hologenome theory of evolution developed by Jefferson (1994, 2007) proposes that natural selection occurs at the level of a holobiont, comprising the population of microbial constituents together with a replication-competent macro-apobiont; in essence a populated scaffold. It asserts that the genetic composition of the holobiont comprises the genetic contributions of the micro- and macro-biota in a form called the hologenome and that this ‘hologenotype’ is optimized by natural selection for its performance and persistence over time, but also for its plasticity and responsiveness to change. The origins of the theory hinge on studies of glucuronide metabolism by diverse vertebrate-associated microbes. The concentration and bio-availability of virtually all the steroid hormones that modulate, regulate or control reproductive performance, mate choice and ontogeny of vertebrates depends on the microbial processing of conjugated intermediaries, including steroid glucuronides. This occurs in microbially-rich complex ecosystems including intestine and surface epithelia, and is mediated by glucuronidases, arylsulfatases, permeases and other enzymes encoded by an extraordinary diversity of microbial constituents, and allows levels of these circulating hormones (and countless other metabolites) to be adjusted by action of a dynamic population of microbes that in turn are intrinsically sampled from and sampling the environment. The implications from this premise are many, and in many ways, non-trivial. The ability to alter and modulate, amplify and suppress, disseminate and recruit new capabilities as microbially-encoded ‘traits’ means that sampling, sensing and responding to the environment become intrinsic features and emergent capabilities of the holobiont, with mechanisms that can provide rapid, sensitive, nuanced and persistent performance changes. Hologenome theory is essentially probabilistic. The population of microbes associated with the performant microbiome of a holobiont is neither fixed nor necessarily predictable, with the holobiont behaving as an indeterminate, temporally persistent standing wave. Just as quantum theory (quantum field theory and quantum mechanics) allows a more accurate and generalizable description of physical phenomena at small and large scale both in time and space, so hologenome theory accommodates observations of the ubiquity and function of microbial populations, but also exposes observational and cognitive bias that has hitherto dominated our thinking about evolution and life sciences and their applications to society and the environment. This includes obvious impacts on health and agricultural improvement strategies, but curiously also economics and social institutions. The now classical ‘New Synthesis’ of evolution is by extension, basically a ‘Newtonian’ view of evolution and has fostered a scholarship of symbiosis that focuses on individual interactions rather than probabilistic, synergistic and dynamic populations and the complex and resilient systems these produce. In this presentation I will review the biochemical and molecular genetic experimental work underlying the articulation of the theory, and describe some of the implications of its probabilistic nature that neither requires nor supports the intellectual construct and memes of ‘host’ and ‘symbiont’. RA Jefferson (1994) The Hologenome in “’A Decade of PCR: Celebrating 10 Years of Amplification,’ Proceedings of a Symposium” Video released by Cold Spring Harbor Laboratory Press, 1994. ISBN 0-87969- 473-4. A few months ago, I had the opportunity to speak in Portland, Oregon on my thoughts of opening the innovation ecology. The talk was sponsored by a non-profit, Illahee.org. The talk was introduced by Illahee’s Director, Peter Schoonmaker. In his blog post, Peter described his summary of my presentation. I used the occasion to wax lyrical about the congruence of the hologenome theory of evolution with our work on creating an open and transparent innovation cartography tool. I tried to find a common thread of ‘biological innovation’ that can guide not only the practical realities of improving health, agriculture, environment and energy, but also the formation of productive and equitable economic and social structures and tools. The world’s greatest disruptive act of Open Access Publishing. The Dutch are pragmatists. If there’s a more practical, hard-nosed, outcome-oriented culture that is steeped in business and trade, it might be the Chinese. But the Dutch are (in so many ways) giants in the history of trade and commerce. So it may be surprising that what is arguably history’s most disruptive act of creating a ‘commons of knowledge’ that opened up global trade to competition and fair-play came from a Dutchman, Jan Huygens van Linschoten. van Linschoten managed in a single act of sharing – in his case the pilfered Portuguese portolans and charts – to open the world of maritime commerce up to free and open competition, stimulating an era of growth and innovation in technology – shipbuilding, sailing, logistics, cartography and navigation – and in business – insurance, investment tools, financial instruments – that changed civilization for ever. 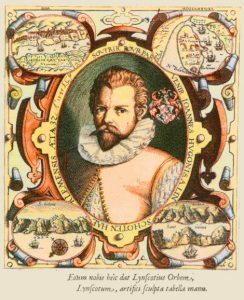 In 1596 or thereabouts, van Linschoten published what had for over a century and a half, the state secrets of Portugal – the maritime cartography of the Indies – West and East. Since its inception twenty five years ago, Cambia has had one goal, even a passion: to ‘democratize’ science-enabled innovation. After over twenty years of laboratory work in CambiaLabs, creating, distributing and supporting openly available biological enabling technologies to the global research community – some of which are amongst the most widely used in the field – we hung up our lab coats and put away our pipettes a few years back. After over ten years of developing, improving and hosting the Patent Lens, a hugely popular open web resource, we’re soon to be retiring the site per se. After almost ten years designing, launching and supporting the BIOS Initiative (Biological Innovation for Open Society, aka Biological Open Source), its new ‘open source’ licensing strategies and its online collaboration platform Bioforge, we pretty much stopped about three years ago. We turned off bioforge.net. So we’re quitting? We’ve run out of steam? Is this the inevitable demise of the simplistic, science as social enterprise, sharing paradigm? We have worked hard, contributed some and learnt much in these decades. But progress through scientific method is based on having hypotheses *disproved*, not proved. In the course of this – with careful design and with some grudging willingness be wrong – one gets closer to a truth. Biological Open Source won’t work without it. Bioforge didn’t work without it. The Public Sector works very poorly without it. Small enterprise desperately needs it. Big business wastes billions to get it. Put simply, we have to completely shift the demographics of problem solving by creating a global, open and dynamic resource for ‘innovation cartography’. We must make it possible for virtually anyone to understand the landscapes of science, intellectual property, business, regulation and other innovation ‘intelligence’ that is necessary to make creative enterprise a possibility at all levels of society. The next posts will be about the ‘how’. But it will *start* with the world’s patents as the entry point to innovation intelligence. These now immortal words of the neo-bard Donald Rumsfeld, though often lampooned, actually provide a helpful insight into the nature of innovation and landscapes on which it occurs. Innovation, like navigating the high seas, is as much a matter of not steering a wrong course as it is steering the right one. This is particularly so for those whose resources are limited, and where the risk of failure courts disaster. In innovation thinking – itself almost an oxymoron – talking about how to make right choices and fostering sparks of creativity seems the dominant discourse. But the realities of innovation are that most of the innovation process is grueling hard work, and the hard yakka is in avoiding stuff ups: endeavouring mightily not to ‘run aground, or crash into continents’. So what are these continents, the reefs, the shoals and the currents that could take our ship of creative product and service delivery down to Davy Jones? In those sectors driven by science-and technology-enabled innovation (SEI), much of the uncertainty, the obscurity, the buried bommies are in the world of intellectual property, and most of this in the patent literature. Curiously however – much of the excitement and opportunity of future and futuristic problem solving also lies in this same byzantine, obscure, clergy-ridden literature. So what is it and how do we navigate it? I finally unearthed the old videos of my Cold Spring Harbor talk in 1994 in which I outlined the ideas and context of the ‘Hologenome’ as a new lens on evolution. Cold Spring Harbor actually packaged and (briefly and presumably unsuccessfully) marketed these videos of the meeting. Now out of print. At that time (September, 1994) I was trying to set the scene for why studying, understanding and manipulating complex systems with tools and approaches of reductionism would not be enough. I started in part one with the concept of getting ‘Beyond the Model System’, and used real-world agriculture and environment as the entry point for that discussion. I’d like to share an email exchange I had some months ago with Eugene Rosenberg, one of the authors of some extremely interesting papers outlining the hologenome theory of evolution. He and his wife, Ilana Zilber-Rosenberg apparently completely independently from me articulated the hologenome theory from their experiences in microbiology and nutrition, and coral microbiology in particular. In 2009, I found some Rosenberg papers describing the hologenome theory from 2008 and 2009. I was delighted at the clear and lucid writing and exposition, and that their observations leading to the hologenome concept came from such a different field to my own. 2) the role of endophytic and epiphytic microbes in plant performance in agriculture, including of course rhizobia and numerous other plant-associated bacteria. I’ve had an absurd number of people urge me to break my life-long writers’ block and start to put some of the lessons from the last couple of decades on (virtual) paper, so others can learn, criticize and comment, and so I can improve our strategies. So I’ve undertaken that in the next year, I’ll write extensively on innovation systems, biological evolution, agriculture, patents, new technologies, social equity, biotechnology, environmental interventions, hologenomes, open stuff, and so on. I haven’t decided if I’ll do it just on this blog, which seems one of the best-kept secrets on the internet, or publish in more conventional outlets, and mirror and discuss those pieces here. Probably a bit of both. At Cambia, to create the Patent Lens (www.patentlens.net) we’ve probably spent USD 300,000 or more over the years to acquire and serve to the public the full text and images of US Patents and Applications. This is a pretty heavy load for a small non-profit, but through commitment by our supporters, we’ve managed. When the Open Government Directive was announced in the current administration, I was hopeful that the US Patent and Trademark Office would begin to make its bulk patent data available at no cost, and as well, create a way for the public to access the important ancillary data relating to status and prosecution history, called ‘PAIR’. When USPTO announced the unusual partnership with Google to do just that, I was both pleased and a bit nervous that this was creating a cozy relationship with one big player in the information space, reminiscent of the relationships that EPO has had with ‘added value’ information gatekeepers. I was also a bit skeptical that it would work and would deliver. What happened in the last months since Jon Orwant at Google began hosting the bulk data was remarkable. But it was incomplete. The most valuable information (financially and often technically) is the most recent set of documents – the applications and grants published this year – and ideally this minute. And these were lacking. Until a couple of weeks ago, there was essentially no 2010 data on the Google bulk site. I was concerned by this, and spent some serious time and bandwidth in conversations and emails with people in the Government and at Google, and in the last couple of weeks, the responsiveness of the USPTO, Google, the Commerce Department and the Office of Science & Technology Policy has been nothing short of spectacular. In fact, the whole experience made me realize that ‘Open Government’ is a passion and a mission to many of its practitioners in Washington and Virginia, and that there are some real heroes in the system who should get recognition. A couple of years ago, a contributor to the BioForge forum, ‘Meredith’, asked me why Monsanto would ever participate in the BiOS Initiative or any other open source idea. I decided to repost an edited form of my reply here, since many others ask the same question. Well, Monsanto STILL hasn’t signed up. It has however published patent applications showing that our Transbacter technology – which is a core CAMBIA BiOS work product – works well in their key crops (soybean, corn, canola, cotton). It validates both our technology and more importantly, the premise that a dominant patent could be used to leverage community access to improvements. Of course the only entity that can speak for Monsanto is Monsanto, so commentary by any of us about why or whether they’ll participate is only conjecture. However, I would comment that ‘financial savvy’ is a great reason for them to participate on several fronts. By thinking of the different ‘levels’ at which technologies act, one can imagine different treatments of these technologies with regard to sharing or hoarding. This is similar to considerations of the ‘stack’ in software, where such components as operating systems, programming languages, interoperability standards, middleware are generally shared tools required to move the sector forward. Then applications or suites of capabilities represent commercially viable products and services. This topic is such fun, I could log in each day and all the ideas I’ve had for thirty years would start lining up on the framework of hologenomics. In the last few years our lab has been getting more deeply into Type IV Secretion Systems. We set out some years back to ‘re-invent’ the Agrobacterium tumefaciens plant gene transfer capability in other families and genera of bacteria. The reasons were twofold. First to invent around a very egregious and complex patent ‘thicket’. This one is a treat. An opportunity to blog about my ideas on science! It seems that most of my efforts these days are focused on BiOS, patent transparency and innovation strategies. Science is still an important part of my life, but my dismay at the way it has been co-opted and made less relevant to society has left a bitter taste. Still, there are new fields that are breathtaking in their implications (to me at least) and which do not lend themselves to being ‘owned’, but – at least at this stage in their development – rather shared. The single most exciting development in the biological sciences to occur in my lifetime is the idea that microbes are not only ubiquitous but that they may be the most important component that drives the evolution of macro-organisms. In fact, I’d venture to say that multicellular eukaryotes only exist in nature as complexes of organisms in which microbial genomes are critical, essential contributors to the fitness of the overall ‘individual’ (which itself needs redefining). Back in September of 1994 I gave an invited presentation at a Symposium at Cold Spring Harbor sponsored by Perkin Elmer Corporation: “A Decade of PCR“. The symposium was only a couple of days, was a celebration of the impact and future of PCR on life sciences, and featured Jim Watson, Kary Mullis, and a number of other prominent speakers. I was given the task of talking about Agriculture, Environment and the Third World. Rather dauntingly broad marching orders. But I decided that I’d try something fun out on the audience, which was a pretty substantial group of scientists. Well, its been a busy few months since my last post. I’ve been constantly traveling to meetings and working with prospective partners to try to generalize our work. It now seems that the fundamental power of a harmonized patent informatics platform and a facility for supporting open innovation work has become widely appreciated. We’ll be going to scale soon with a sector-agnostic activity we call the Initiative for Open Innovation (IOI) under which the Patent Lens will be a prominent platform. I’ll write extensively over the next weeks about this, but briefly the idea is to form a worldwide open access capability to integrate, parse, visualize and analyze patent data over all nations and all innovation sectors. We will develop – collaboratively – open source, community participation web apps which will allow creation and curation of ‘landscapes’ of key IP areas, for instance, influenza vaccines, RNAi technologies, cancer diagnostics, agricultural genetic resources and so on. However, its now becoming clear that this should extend well beyond the life sciences, as indeed virtually all innovation activity is facing the complexities of a patent system in meltdown. Transparency really is critical, but the transparency must provide for high level oversight, not just the piecemeal ability to search for patents. Rather it will be critical that all interested citizens, scientists, business people and policy makers should be able to visualize and appreciate the nature and extent of current and projected patent coverage over areas of particular interest. This will require highly professional curation, annotation and involvement, but it will be greatly facilitated by sophisticated informatics. Our intention is to work with many nations to digitize and integrate their own patent information so it can be searched in their own languages, and with natural language translation where possible, to open it for inspection to all citizens, everywhere. Of course, APIs provision and mirroring in diverse locations is part of the plan; but the foundation of the platform – the Patent Lens – is anticipated to become an enabling facility for open innovation. Much more to come in future posts. I sensed that there was something fundamental missing. What is it about ‘human rights’ that is uniquely ‘human’, which would constitute such a critical feature of being ‘human’ that it should be articulated as a right, and which informs and grounds all discourse? Of course it must be right there on the Lost First Page. Jane Goodall drew my attention to it, as did Charles Darwin, perhaps without meaning to, and posthumously of course. Almost all technologies in the life sciences are intertwined and interdependent. Few discoveries stand on their own, and fewer inventions. Not only do they each depend on the pre-existing knowledge base, they almost always incorporate components of many other technologies in their execution. This is particularly true for tools and technologies that are what I call ‘meta-technologies’, whose effects are broad and that are useful for communities of innovators who are quite distant from the inventor of the tool. Consider the wheel. It is clearly a tool, and clearly a meta- technology. In some ways, it is the most fundamental and important tool in society, as it has so many uses, unanticipated by its inventor(s). These uses are countless, and they are mostly made by people who are not wheel-builders. With the welcome attention to ‘neglected diseases’ such as malaria and tuberculosis associated with poverty, there is a tendency to forget the many health challenges such as heart disease, diabetes and cancer which wreak havoc in both worlds. These ‘shared diseases’ have dramatically different markets in both first and third world, and some thoughts about the disparity in options exposes some structural failings and innovation opportunities. Leaving the development of diagnostics and treatments of such diseases and conditions to market forces, especially when intellectual property can be used to control entry of new players, will continue to render these debilitating but familiar illnesses a sad litany of social inequities. Are there ways that research-intensive solutions can be cooperatively generated that can grapple with this challenge? More of the world dies of cancer than almost any other single disease. According to the WHO, cancer kills almost seven million people a year of whom about half are in the developing world. By comparison, AIDS-related conditions kill about three million people a year. In the industrialized world, the availability of diagnostics and therapeutics for cancer, while often outrageously expensive, can lead to very favorable outcomes. In the poorer parts of the world, diagnostic technology, when available, is inadequate to the task, and few therapeutics are affordable. There are literally millions of people who die of cancer each year in the poorer parts of the world, many of whom could have had longer and more productive lives if the diagnostic and therapeutic options available to their rich neighbors were available to them. With cancer, it is not the disease that is neglected, but the diseased. Telomerase is an enzyme in human cells which repairs the ends of chromosomes, and is tightly regulated in normal and normally aging cells. However in tumor cells and tissues, telomerase is often wildly de-regulated, rendering such cells virtually immortal. As such, it has been viewed as the platform from which a key ‘silver bullet’ for cancer therapeutics, for diagnostics, for gerontology, even for production of stem cells, could evolve. In two weeks – April 19th – I’ll be at another conference in Melbourne, the World Congress of Science Journalists. At that congress, I’ll be producing a session about who benefits from science in a world where virtually every scientific discovery and platform is patented, and the elephant in the room: capability to use science. Phil Campbell, the editor of Nature (the magazine, not the phenomenon) will participate and we hope to expose the journalists to the realities of what’s happened as science becomes fragmented and owned. Few understand the world of patents, fewer still appreciate the profound impacts on our society. I made a presentation at the A2K meeting last year called Mapmakers and Mariners, Shipwrights and Sailors. I had prepared it while sitting on the stage listening to the other speakers (my preferred mode of preparation). it was inspired by a conversation I had with a fine journalist named Kenn Cukier. In that discussion we were exploring the parallels between the intense competition to navigate the oceans during the creation of the European mercantile empires of the 1400-1800s, and the ability to navigate the patent world now in the new millennium. In both cases, the proprietary knowledge of the routes, the shoals, the dangers, the currents and the ports was of enormous importance for achieving commercial advantage, and of course economic primacy. Kenn later went on to write an exceptional piece for Nature Biotechnology about navigating patents in biotechnology, further exploring this metaphor. In the late 1600’s, the Spanish could risk the Manila Galleon traveling from the far East to Spain via the Pacific Ocean – and many of the annual Galleons sunk – because the reward was so high. The profits on silk, silver and spices were astronomical. Navigation and seamanship would have to be exquisitely well developed to justify smaller profits; simply to drop the risk profile. And indeed over the years, as both cartography and maritime technology improved, so did the volume, quality and reciprocity of trade. And of course it was the tools development that drove the navigational capability: the marine sextant allowed latitude to be calculated, the marine chronometer, the longitude. It is clear that the ability to see the dangers and opportunities, the detritus and the value within the patent system was going to be critical if science and technology is to achieve a greater social good, especially for small markets or weak market signals – one way to say ‘for the benefit of poor people’. I attended a meeting called A2K (Access To Knowledge) held at Yale last year (Conference Wiki). I got to hang with some friends whom I admire, like Yochai Benkler (one of the organizers) and to get to know some remarkable people, like Shay David – a clear and articulate thinker who has since visited us in Canberra. For all the quality at the meeting, I was somewhat disappointed that there was an exclusive focus on ‘making information available’, but no one was talking about the Elephant in the Room, namely the extraordinary restrictions that were developing on the ‘capability to make use of that information’. It shouldn’t have been surprising I suppose, for a group of academics – for indeed it was pretty much all academics save perhaps me and the janitor – to not be worried about constraints to the creation of tangible economic value – the core of innovation, as it is generally outside of their purview. But it was nonetheless greatly unsettling. I find the simple thought experiment that comes from testing hypotheses in physics to be a useful exercise. If you’re proposing a course of action, it is instructive to imagine it succeeding (testing the hypothesis at the limit cases), and asking what consequences would eventuate. In the case of universal access to information, let’s imagine all information is available to everyone, everywhere, at no cost. What then? Well, ultimately there is no impact of that information on our lives until it is ‘converted’ into products or processes. And the ability to ‘convert’ knowledge, what I call the ‘capability to use knowledge’ is associated with barriers, the most prominent one these days being patents. Thus, if you control by patent (or other means) the permissive use of a process of actually making a drug based on some scientific information; or making a crop based on rice genome information; or making a diagnostic for cancer based on clinical data, then you have effectly co-opted and obtained exclusive control over the value of the entire supporting body of ‘public’ information. So that ‘public information’ only there as a publicly funded (or publicly sanctioned) subsidy of the value proposition for those who control its further development into economic outcomes. We all know the answer, of course. And it bears on the question of the unpalatable abuse of the patent system. Why do these people do it? Same answer. I was working with CAMBIA’s Patent Lens team on the forthcoming ‘landscape’ of patents around plant genes, and stumbled on a newly published patent application. It didn’t list the owner / assignee / applicant…just the inventors and their law firm. But I recognized one of the inventors (and the address, near St. Louis, was a giveaway) and a moment’s Googling confirmed it. Imagine my surprise! Monsanto figures very prominently in the patent landscape, having filed countless wholesale sequence patents either directly or through their proxy companies, like Mendel Biotechnology, covering genes and promoters from rice, Arabidopsis, maize, cotton, soybean and presumably daffodils and snapdragons. But this patent application, US 2007/67865 A1, which had been hidden from view for years really grated (It dates from a US utility application from 2000, before publication was standard, and only published in 2007). It claims about 463,173 separate annotated plant genes. Actually it claims exactly that many. Oh and it discloses them too, sort of, although the gargantuan file from the USPTO seems somehow corrupt. Matches the practice I guess.